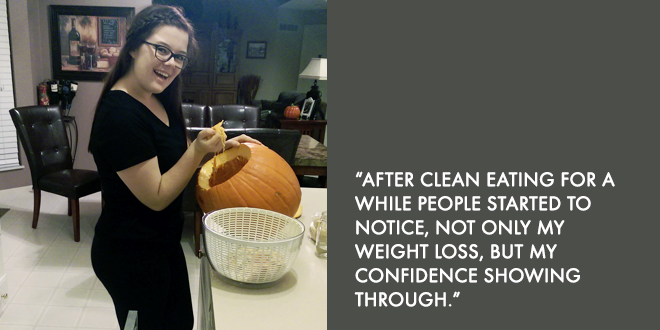 Whole30 Success Story: Meet 16-year-old Katie S.
When we heard Katie’s story, we knew we had to share it. Her passion and enthusiasm shine through in her words. Her honesty will break your heart. We fell in love with this brave, tenacious, bubbly teen, and we know that her story will inspire those of you still in junior high or high school to consider using the Whole30 to change your life, and the lives of those around you. My name is Katie S. I am sixteen years old and I am a junior in high school. In my free time I love to bake, cook, and read. One day I hope to pursue a career in baking because baking has become a true passion of mine. A typical night after school consists of helping prepare dinner for the family or testing out a variety of recipes for my whole family to enjoy. One morning I woke up and realized I needed a change. I need to take care of the one body I will ever have. I didn’t like myself — I didn’t like my weight, my personality, or my self-esteem. My aunt and uncle introduced me to the Whole30 when I was staying at their house for a week. They were both on the Whole30 at the time, so all the meals they cooked were compliant, delicious, and satisfying. When I went home, my mom, my sister, and I made the decision to start the Whole30. On August 4th, 2014 my life changed. The first week was hard. I craved everything I couldn’t have. As the weeks progressed it got slightly easier, but like every challenge we face in life, it was something I had to work through and conquer myself. 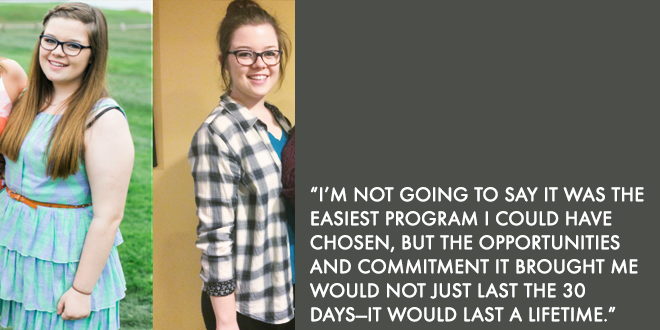 I’m not going to say it was the easiest program that I could have chosen, but the opportunities and commitment it brought me would not just last the 30 days—they would last a lifetime. The many challenges I faced when I sat down to eat a meal really showed me I needed to do this for myself, not anyone else. People didn’t try to be hurtful, they just didn’t understand. People were used to me only eating junk, so when I showed up with carrots and chicken breasts people were confused. They would say my food looked gross or I was starving myself because I wasn’t eating as much as a used to. I constantly got comments about my food, or when I talked about starting the Whole30 people would say I should eat however I want and just work out. People didn’t understand I wanted to eat healthy. I wanted to challenge myself. I wanted a change. People say hurtful things when they don’t understand. The words people said did not hurt me; they made me stronger. I would advise everyone who is thinking about doing the Whole30 to take those comments from others who are not doing the program and use them as encouragement, not let them be something that could make you fail. There were many temptations thrown my way, from school lunches, family parties, and holiday activities I had to show my self-control and not give in to the many unhealthy foods that were brought my way. When I wanted to cheat or quit the program, I had to fight. There were many nights where I wanted the bag of chips in the pantry or make a batch of cookies, but I knew I couldn’t. When I was attending a place where I knew they didn’t have the food I could eat I always had snacks on hand. (Having a snack has saved me many times.) 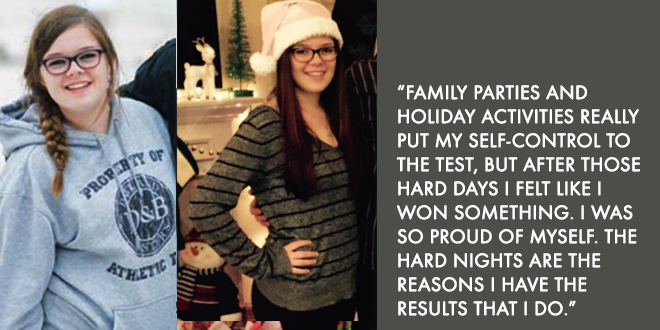 Family parties and holiday activities really put my self-control to the test, but after those hard days, I felt like I won something. I was so proud of myself. The hard nights are the reasons I have the results that I do. There were many comments that said such as “one bite won’t hurt you,” and people wanted to eat certain foods just hearing my story because they thought I was depriving myself of food this world offers and considers them the “happy” food. I’m not saying these words tore me down because it made me want to fight harder to prove you don’t need those foods that are typically known to make you happy. The foods that truly make me happy are the ones that are good for my body. Read more about how to help your teen to find their food freedom. After following a Whole30-inspired diet for a while, people started to notice, not only my weight loss, but my confidence showing through. As a teenager weight is directly related to confidence. The people that questioned my change realized that it could benefit their lives as well. Many people have started the program because of me. My mom’s friend and her husband started on January 1st. They said if I can do it they can do it too. My friend has also started the program very recently, and I am helping her through it. Whenever she needs help she will ask me for advice or see if something is okay to eat or do. Fast forward to six months later. I have lost 45 pounds and feel like a new person. Before the Whole30 I was a very shy person, it was very hard for me to talk to people. But with this change I have gone through for the past six months while doing the Whole30 has made me break out of my shell and become a better person. I have not only changed myself but other people as well. I wish to help others start their new journey; it has made me a better person just knowing that I can be an inspiration to others. I feel like I am a whole new person. In school, I work harder and focus better. I fall asleep faster and sleep all through the night. I can get through the day without wanting to take a nap. Overall, I feel more confident and outgoing. Just one simple month made me change for the better. Because of the Whole30 I like where I am with my weight and I learned to love myself. I hope my story will inspire others as well as show people that this change not only affects your body, but also your mental being. Like the Whole30 website shares, this is a lifestyle change, not the new fad diet. You will not only carry out this program for the 30 days but you will use this lifestyle for the rest of your life. I understand that I am young but you are never too old to start. As for my love of baking, during my first round of Whole30 I set baking aside for that month. In the later months I experimented with Whole30 approved foods. I didn’t bake, but I made healthier options than the cupcakes or the cookies. For example, for a dessert, I would take apple slices, almond butter, and raisins to make a sweet treat. The Whole30 has made me think of my career choice in a different way. I learned there are healthier options. Baking is not just the butter and the sugar, it is creating something for you or others to enjoy. Do you have a Whole30 success story? We want to hear from you! Send your story to mamas@whole30.com!